We actually have to start with some more basic differential geometric notions that have been neglected, because we never did a “Differential Geometry from the Beginning” series (perhaps I should in the future? Chime in in the comments if that would be desirable, though I might try to find someone else to write it, as I’m not a real expert on that stuff). We’ll just assume, though “smooth manifold” and “Riemannian metric” largely because they would deserve posts of their own, and these are things that I think the target audience of these posts are probably ok with (correct me if I’m wrong!). Definition　The hyperbolic plane (in the Poincaré half plane model) consists of the points of with and which has metric . This means that if you start from any point, the real line is infinitely far away from it. A quick historical note: even the Wikipedia page points out that the half-plane model is due to Beltrami, a name that reappears often in Teichmüller theory. 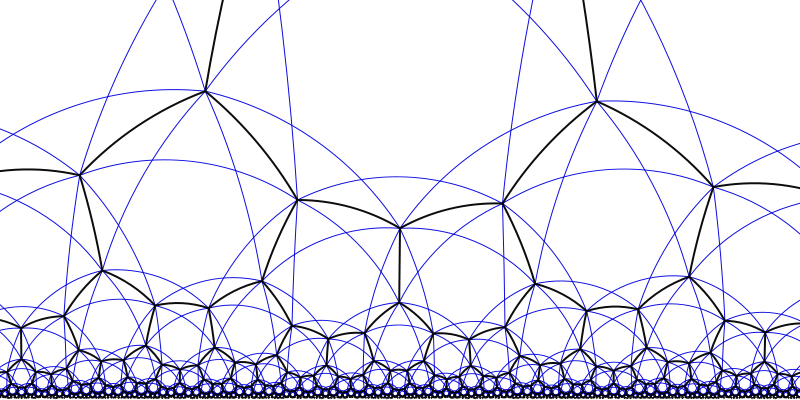 A tiling by geodesics in the hyperbolic plane. So what sorts of isometries are there? The linear fractional transformations! If we treat as , then we can write them as where is a matrix with determinant 1. This group is precisely . In fact, the correct group is because minus the identity acts trivially. As a final aside on the half-plane in and of itself, we look at the subgroup , and we can see that it acts very nicely on the upper half-plane (though not quite as nicely as you’d really hope for quotients, and that’s part of the fun) and some finite index subgroups act even more nicely. We call this the modular group (and some of the subgroups are called congruence subgroups) and the quotient of the upper half-plane by it is the modular curve (or a modular curve). Modular curves are VERY important, and show up in all sorts of problems in number theory (which I’m sure Jim will talk about at some point), including the proof of Fermat’s Last Theorem. This entry was posted in Uncategorized and tagged hyperbolic geometry. Bookmark the permalink. Oh, this starts rather exciting. Do you intend to go in the direction of the construction of Teichmueller space using local coordinates (Fock, Goncharov, Kashaev or whatever) and connections with geometric Langlands programme? Also, this whole moduli spaces of Riemann surfaces story is very interesting from the mathematical physics point of view. We’re definitely heading through construction of Teichmueller space, via a combination of Hamenstadt’s notes from the relevant PCMI and the classic article by Bers which was my first encounter with the material. Do you know a decent reference on the connections to Geometric Langlands? I don’t know that subject well. Also, we might talk a bit about some extensions and connections to strings once we’ve built the moduli space two ways (Teichmueller and GIT) and discussed some “basic” geometry/topology. Where it comes to references, I know about this paper by Teschner: arxiv.org/abs/1005.2846, so hopefully that would be helpful. However I’ve a physical background, so I can’t say how approachable it is for a mathematician.